Popular with many people of Irish descent, Celtic tattoos embrace a wide range of designs and possibilities. Among them are the Celtic heart tattoos. These tattoos have a heart shape somewhere in the design, and they have a decidedly Celtic flair and style to them as well. Celtic tattoos that include a heart image are more than just a Celtic symbol or a traditional heart tattoo. They often have their own meaning and style separate from other tattoo designs. Different than the traditional Celtic love knot, the heart knot is a Celtic knot that forms the shape of a heart. 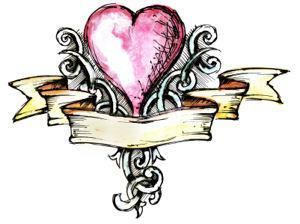 The outline of the tattoo may be left solid with the knot contained inside, or the knot may wrap in and out of the heart's outline. Since the knot is filling in another image, it's typically simple and made up of just one line. Heart knots make good mid-sized tattoos that can be worn anywhere on the body. Making this tattoo too small may obscure the pattern. 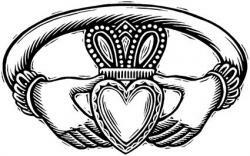 The Claddagh is one of the most iconic Celtic images; its a crown on top of a heart wearing that's being held by two hands. Claddagh tattoos offer a great way to use a heart image in a traditional Celtic style. 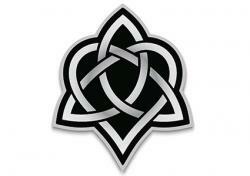 Made up of two interlocking hearts, the Celtic motherhood knot makes a beautiful and personal tattoo. The two hearts are layered with one resting just above the other, with the lines from both hearts interconnecting. A circle or dot for each child is inked somewhere inside one of the hearts. Women with multiple children may want to get a different colored dot for each child, or consider inking the names of each child onto the lines of the knot. The Celtic tribal heart looks very similar to the heart knot, but instead of the heart outline enclosing a never ending knot, it encloses an open knot that ends in tribal-style curls. The interior of the heart around the lines is usually inked so the lines themselves are left bare. 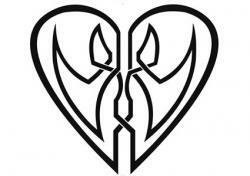 The heart may be surrounded by other tribal-style designs, such as black lines, curls and spikes. Trinity knots contain a traditional, three-loop trinity knot within the outline of a heart. The trinity knot may be overlaid on top of the heart, the heart may be woven through the trinity symbol, or the heart may be placed inside the center of the trinity knot. The trinity knot means many things to different people; pagans believe it represents the three faces of the goddess, while Christians believe it represents the Father, Son and Holy Spirit. Adding the heart may signify blessing a union or declaring your love of your religion. 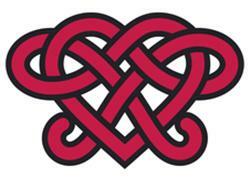 The Celtic lovers heart is a two-line knot. The two different lines meet in the center so that each one of the lines makes up one half of a heart image. They may or may not intertwine in the center of the heart; many designs feature the two lines twisting around each other in the heart's center to symbolize two becoming one. While there are a great many different Celtic tattoos, one of the best ways to show your love of your heritage is with a Celtic heart design. No matter which type of Celtic heart you choose to get, be sure to show it off and wear it with pride.